Be the first to share your favorite memory, photo or story of Emilia. This memorial page is dedicated for family, friends and future generations to celebrate the life of their loved one. 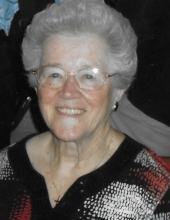 Age 91, of Castle Shannon, daughter of the late Emilia and Albert Sedlak, wife of late Andrew Golmic, mother of Bruce (Maureen) Golmic, Jane (Gary) Gilarno, Nancy (Barry) Rodriguez, cherished grandmother of Lori (Brian) Duggan, Lisa (Neil) Hall, Scott (Caroline) Golmic, Nicholas (Danielle) Gilarno, Corey (Stephanie) Gilarno, and Becca Rodriguez, also survived by 9 great grandchildren: Reese, Drew, Lily, Rylee, Weston, Kyleigh, Evan, Kira and Dominic. Member of Good Shepherd Lutheran Church. Emilia worked many years for J.C. Pennys Regional Credit Office. After retirement, she worked for her church's preschool and was known as "Grandma Millie." She loved spending time with her family and especially loved going to Myrtle Beach. Family & friends will be received at Jefferson Memorial Funeral Home, 301 Curry Hollow Rd., Pittsburgh, PA 15236 on Thursday, November 8 from 2-4 and 6-8, funeral service on Friday, November 9 at 10 a.m. at Good Shepherd Lutheran Church, 418 Maxwell Drive, Pittsburgh, PA 15236. In lieu of flowers, donations may be made to Good Shepherd Lutheran Church Preschool or Good Shepherd Lutheran Church. To send flowers or a remembrance gift to the family of Emilia Golmic, please visit our Tribute Store. "Email Address" would like to share the life celebration of Emilia Golmic. Click on the "link" to go to share a favorite memory or leave a condolence message for the family.